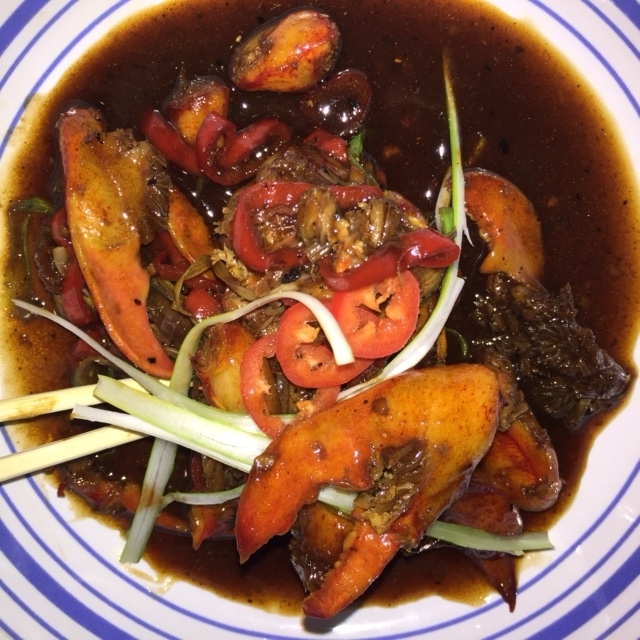 Stir-fried lobster with black bean sauce – not the most visually appealing lobster dish! Lobster is often served as a symbol of prosperity during Chinese New Year or Spring Festival. Not only do lobsters resemble the majestic dragon, a powerful and legendary figure in Chinese culture, the shell of a lobster when cooked turns bright red which is a sign of good luck to many Chinese. Stir-fried lobster with black bean sauce (豆豉大龙虾), or lobster Cantonese-style, is a traditional lobster dish served during Spring Festival. While I generally prefer recipes which pair more subtle flavors with lobster, this recipe is nice for Westerners who want to experience how lobster is served in other cultures. Stir-fried lobster with black bean sauce is relatively easy to make. I was working from previously cooked and frozen lobster meat which made the cooking even quicker. From start to finish, this Cantonese style lobster recipe took me about 30 minutes. Cook the lobster and pick out the meat (if you’re not working from cooked lobster meat). Break the meat into bite-sized chunks and place it in a bowl. Heat up a wok over a high heat, add enough vegetable oil to reach 6cm up the sides and heat until very hot (using caution and not leaving unattended). Add the sherry, cornflour and black pepper to the lobster and mix until the lobster is coated. Carefully lower the lobster pieces into the hot oil and fry for about 1 minute, until the coating is crisp. Remove the lobster from the wok and place in a sieve or on some paper towel. Discard all but about three tablespoons of the oil from the wok, reheat up the oil then add the garlic and ginger, stir frying for about 30 seconds, taking care not to burn the garlic. Add the black bean paste and chilli, stir frying for a further 1-2 minutes. Add the lobster, rice wine and stock, stirring until the mixture comes to the boil. Add the caster sugar and soy sauce, then stir well and reduce the heat until the mixture is simmering. Cover the wok with the lid and simmer for 2 minutes. Add the spring onions and continue to simmer for a further minute. Plate, add a the remaining spring onion slices and serve. While not as visually appealing as other lobster dishes I’ve cooked, it was nice to try a new, Cantonese-style lobster recipe. I served this stir-fried lobster with black bean sauce with a lovely Viognier and think champagne would also go perfectly with this dish.